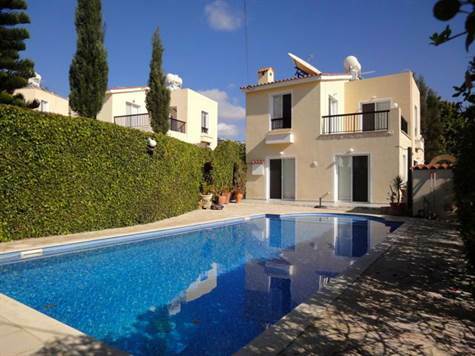 Peyia, Paphos, Cyprus - This 3 bedroom detached villa is located in a quiet residential cul-de-sac in Lower Peyia. The village has a wide range of local amenities and the popular resort of Coral Bay is a few minute’s drive away. The property features spacious L-shaped living accommodation including a comfortable lounge with flame gas fire and natural stone surround and useful storage cupboard. An attractive archway and breakfast bar separates the formal dining area from the modern stylish kitchen which is well equipped with granite worktops and splash back, fridge/freezer, dishwasher, built-in oven and microwave, electric hob and extractor fan. A smaller archway off the lounge leads to a double size bedroom with fitted wardrobes, a shower room and additional built-in cupboards in the hallway. Upstairs are two good size double bedrooms with fitted wardrobes and a large family bathroom. The master bedroom enjoys easy access to a private balcony plus a shared balcony with bedroom two . Both balconies are spacious and have stunning mountain and sea views. The property is designed with low maintenance in mind with private paved terraces and gravelled areas. Patio windows in the living area provide easy access directly to the 9 x 4 swimming pool and surrounding terrace. There is a long driveway with plenty of space for parking.